A palatable, mildly abrasive toothpaste, suitable for regular use on cats and dogs to promote optimal dental appearance and hygiene. 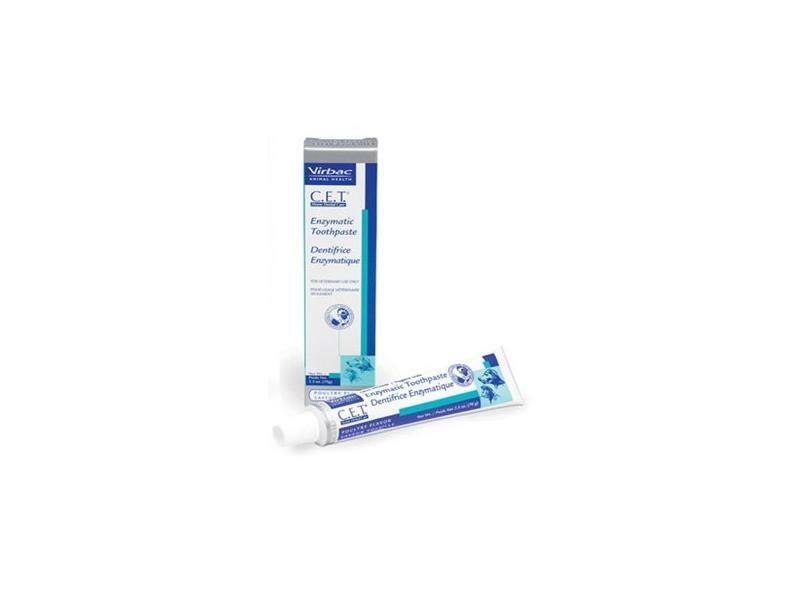 Contains active ingredients formulated to target plaque-forming bacteria and eradicate it, thereby improving the overall health of your pet's mouth. May reduce the chances of tooth decay and gum disease when used under normal conditions. Sorbitol, Amorphous Silicon Dioxide, Glycerine, Dicalcium Phosphate Anhydrous, Titanium Dioxide. Below are some recent questions we've received regarding Virbac CET Enzymatic Toothpaste for Dogs & Cats, including answers from our team. Does it contain chicken? Dog is allergic. Our dog is allergic to all meats except duck and rabbit. Does this toothpaste contain any chicken or other animal products or is it just a synthetic flavouring? Thanks. Thank you for your question. There is poultry digest in this product, so it probably won't be suitable. The full list of ingredients can be found below. Malt flavor: Sorbitol, Dicalcium Phosphate Anhydrous, Purified Water, Hydrated Silica, Glycerin, Barley Malt Syrup, Dextrose, Xanthan Gum, Potassium Benzoate, Potassium Thiocyanate, Glucose Oxidase (Aspergillus Niger) and Lactoperoxidase. Poultry flavor: Sorbitol, Purified Water, Dicalcium Phosphate Anhydrous, Hydrated Silica, Glycerin, Poultry Digest, Dextrose, Xanthan Gum, Titanium Dioxide, Sodium Benzoate, Potassium Thiocyanate, Glucose Oxidase (Aspergillus Niger) and Lactoperoxidase. Vanilla-mint flavor: Sorbitol, Purified Water, Dicalcium Phosphate Anhydrous, Hydrated Silica, Glycerin, Dextrose, Xanthan Gum, Vanillan Titanium Dioxide, Sodium Benzoate, Methyl Salicylate, Potassium Thiocyanate, Glucose Oxidase (Aspergillus Niger) and Lactoperoxidase. Cat toothpaste suitable for dogs? Cat toothpaste fish flavored- may I use it safely for my dog? The toothpaste is suitable for regular use on both cats and dogs. My son is like the taste of chicken. The 70g tube is Chicken flavour. It should be palatable for your pet.